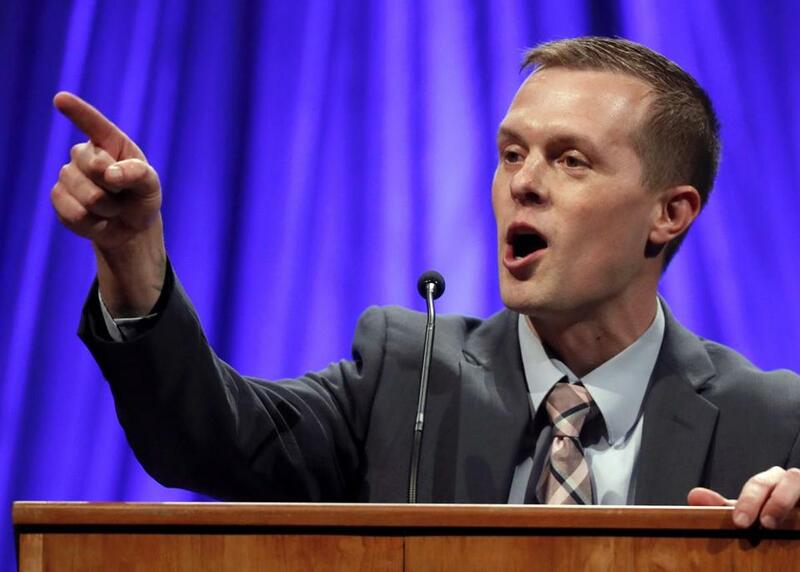 Maine state representative Jared Golden, the Democratic candidate challenging Republican incumbent Bruce Poliquin, addresses the Democratic Convention in Lewiston on May 18. By title, Bruce Poliquin is the United States Representative from Maine’s Second District, but one might well mistake him for an enrollee in the federal witness-protection program. The obscure two-term representative is perhaps best known nationally for his awkward effort to avoid a Washington reporter trying to ask how he planned to vote on repealing the Affordable Care Act. Determined to duck questioning, Poliquin headed for the restroom — for women. After a quick correction, he darted into the men’s, emerging some minutes later with ear buds plugged in to protect himself from the pestering press. Poliquin is the lone Republican left in the New England congressional delegation, making him a target of Democrats who want to flip the House of Representatives, the better to stand up to President Trump. This Maine congressional campaign has become New England’s most heated. But putting national context aside, Poliquin isn’t the right candidate to serve Maine’s economically challenged Second District, whose expanse includes much of southwestern and central Maine and, from there, runs along the Downeast Coast and its blueberry barrens, and through inland forests and potato fields, to Canada. The Globe urges voters to support Democrat Jared Golden, a former aide to Republican Senator Susan Collins and the current assistant majority leader in the Maine House of Representatives. Poliquin campaigns like an undercover candidate. His office doesn’t put out an advance schedule of where he will be. His campaign spokesman doesn’t return calls. Or e-mails. Or texts. Constituent visits to his Bangor and Lewiston offices were, until recently, by appointment only. 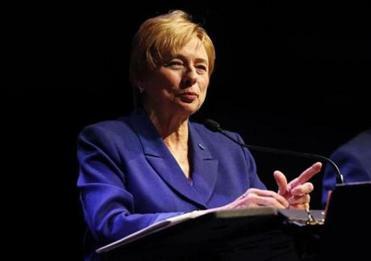 Janet Mills’s broad experience and pragmatic plans stand out in the Maine race. Problem: Golden, a Lewiston-area native, left college after the 2001 terrorist attacks, joined the Marines, and served combat tours in Afghanistan and Iraq. That, needless to say, is not the profile of a radical. Further problem: Golden has already declared he won’t vote for Pelosi for speaker. And though Poliquin portrays him as a threat to Maine gun owners, Golden doesn’t favor banning AR-15s or even closing the gun-show loophole. (We wish he would.) As for Poliquin’s bizarre anti-heating-oil charge, the low-key former Marine shakes his head in resigned amusement. For his part, Golden notes that Poliquin voted to repeal the Affordable Care Act in 2017, something the GOP incumbent tries in various ways to camouflage. Golden himself favors expanding Medicaid in Maine. Poliquin also voted for the Republican tax cut, whose biggest beneficiaries aren’t the type of people who populate Maine’s northern congressional district. Not year-round, anyway. But then, Poliquin’s own residential connection to the Second District appears awfully tenuous. Although he has some sort of rental arrangement in central Maine, he owns a $3.4 million waterfront home in lovely coastal Georgetown — in the First District. All of which is to say, Poliquin is a poor fit for Maine, a party-line — and duck-and-dodge — Republican using scare tactics to stave off a formidable contender. Jared Golden would be a far better choice.